Taryn Sweeny wears a hockey helmet to protect herself in seizure-related falls. Project UPLIFT helped boost her mood and reduce her seizures. What is Project UPLIFT for Epilepsy? Taryn Sweeney was diagnosed with epilepsy when she was 14 years old. 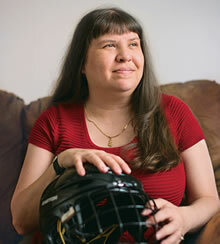 Recurrent seizures, along with resulting falls and injuries, have forced the now 41-year-old Colorado woman to wear a hockey helmet whenever she moves about. Some of her seizures leave her confused and briefly unable to speak. She cannot leave the house alone and has to depend on others to drive her. It's hardly surprising that Sweeney has also wrestled with depression. "I can't get around and do much," she says. "I had really started to feel sorry for myself." Then she heard about Project UPLIFT (Using Practice and Learning to Increase Favorable Thoughts). The program is a groundbreaking distance-delivery intervention for people living with depression and seizures. She didn't expect much, but she was desperate enough to give it a try. Through the program, Sweeney learned to relax and calm her mind and body. Her experience was so positive that she decided to participate in Project UPLIFT a second time. As a result, not only has she been able to keep depression at bay, the intensity of her seizures has actually decreased. "It opens your eyes in a new way," she says. "I come back with more understanding of how my brain and body work, so now I know a better way to handle stress." Project UPLIFT is the brainchild of Nancy Thompson, professor of behavioral sciences and health education and epidemiology. She came up with idea as a result of her work as a clinical psychologist in the 1990s. Thompson knew that patients with chronic diseases are much more likely to experience depression than their mentally healthy counterparts. In fact, the Epilepsy Foundation reports that more than a third of people living with epilepsy also suffer from depression. That's compared with an estimated 6.7% of the general population, according to the National Institute of Mental Health. Despite the enormity of the problem, people with chronic illness are less likely to access in-person counseling due to lack of mobility and social isolation. Back in the early 2000s, Thompson saw that nascent Internet technologies could offer a solution. In fact, when Project UPLIFT started in 2006, it was the first group intervention in which participants had the option of "meeting" via the web or over the phone. Over the course of eight weeks, trained local facilitators lead participants through a curriculum of mindfulness skills as well as cognitive-behavioral therapy exercises to identify and change unhelpful thought patterns. Those skills include the ability to recognize distorted thoughts and challenge their accuracy, shift attention and focus when distressed, and reduce reactivity to disturbing thoughts. The Centers for Disease Control and Prevention funded Project UPLIFT's initial studies. That early research showed that the intervention reduces depression symptoms by more than 50%, with participants showing more knowledge about depression, seizures, and skillful responses than members of a control group. In addition to halting depression, Project UPLIFT has also been shown to reduce the frequency of seizures in people with epilepsy, reducing emergency room visits and associated costs of acute care. Thompson thinks that's because Project UPLIFT decreases participants' stress, a major trigger for seizures. In addition, the training in mindfulness may lead participants to more awareness of possible seizure indicators, such as auras, allowing them to take proactive steps. While the program has trained facilitators in 27 states and in Canada, Thompson and colleagues are currently working to expand Project UPLIFT's reach even further. They're studying the possibility of using a similar curriculum for women with heart disease, people with cystic fibrosis, pregnant women in rural areas, and caregivers. Thompson and colleagues are also doing the legwork so that Medicare and Medicaid may include Project UPLIFT in their funded programs for patients. All of these successes mean the world to Thompson. "I've put into UPLIFT the totality of what I've learned from public health throughout my entire career," she says. "But it's important to remember that the uplifting is done by the patients' own hands, by learning the skills to improve their own mental health."